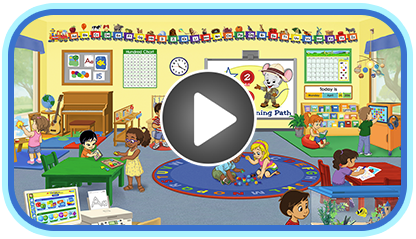 ABCmouse.com’s pre-k math curriculum concentrates on the numbers 1 through 10 and the characteristics of six basic shapes. Learning about the numbers 1–10 includes learning which number word each number symbol stands for (for example, the symbol 5 means the same thing as the word five); learning the counting order of numbers from 1–10; and gaining number sense—that is, relating the number symbols to the amounts that the symbols represent. With respect to shapes, the ABCmouse.com pre-k math online curriculum teaches children to name and identify circles, squares, triangles, rectangles, diamonds, and stars. It also teaches children to observe important characteristics of these shapes and to recognize them when they appear in the environment. Because we recognize that practice is important in all mathematics learning, the math curriculum includes many online pre-k math games.